Want whiter teeth? You are not alone. A recent survey showed that 80% of adult Americans want whiter teeth. There are many products on the market today that will make your teeth whiter. But I only know of one natural way to do it. You must use food grade hydrogen peroxide. 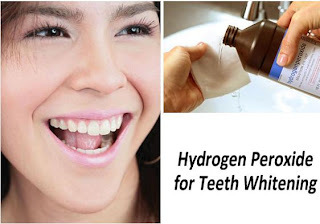 In this article you will learn how to use food grade hydrogen peroxide as an all natural alternative to whiten your teeth at home. But first let's look at what else is available. Some of the products available for purchase to whiten your teeth contain chemicals that I would never put in my mouth. For instance, one that I checked out (and possibly other products) contains sodium hydroxide. Their website describes it as "a pure white solution that not only adds white color to your teeth, it speeds up the whitening process, allowing all other ingredients to be delivered more quickly". Wikipedia's definition of sodium hydroxide is "Sodium hydroxide (NaOH), also known as lye and caustic soda, is a caustic metallic base. It is used in many industries, mostly as a strong chemical base in the manufacture of pulp and paper, textiles, drinking water, soaps and detergents and as a drain cleaner". Used as a DRAIN CLEANER!? I don't know about you but that's not going in my mouth! Anything you put in your mouth, even if you don't swallow it will be absorbed into your bloodstream. Some of their websites do not even tell you what is in their products. Are they trying to hide something? Also, some of these products offer you a free trial but then charge your credit card after the trial is up. Often, you haven't even had the product long enough to see if it will work. Here is what one website said "Try before you buy, pay only s/h today. You will be charged $119.93 in 14 days for our Free Refill Program* unless cancelled." If it's a free refill program why are you going to be charged $119.93? Wikipedia's definition - Hydrogen peroxide (H2O2) is a very pale blue liquid, slightly more viscous than water, that appears colorless in dilute solution. It has strong oxidizing properties, and is a powerful bleaching agent. It is used as a disinfectant, antiseptic, oxidizer... The oxidizing capacity of hydrogen peroxide is so strong that it is considered a highly reactive oxygen species. H2O2 is naturally produced in organisms as a by-product of oxidative metabolism. Nearly all living things (specifically, all obligate and facultative aerobes) possess enzymes known as peroxidases, which harmlessly and catalytically decompose low concentrations of hydrogen peroxide to water and oxygen. Personally, I always prefer a natural alternative to a chemical one. I started using 35% food grade hydrogen peroxide after reading The One Minute Cure by Madison Cavanaugh. This E-book gives a great deal of information on the history of use of hydrogen peroxide in medicine and how it's effectiveness has been covered up, distorted or lied about by drug companies in order to protect their profits. In my opinion everyone should read this book. It gives very specific instructions on how to use hydrogen peroxide. You do not want to use the peroxide that you can buy at a drugstore if it is going to be absorbed into your body. The drugstore variety is for external use only, they contain stabilizers and often contain heavy metals. 35% food grade hydrogen peroxide is the only grade of H2O2 recommended for internal use. It is often used in production of dairy products. But you MUST NOT use it at this strength! It MUST be diluted! See instructions below on how to dilute it. Hydrogen peroxide can be used at 3% strength as a mouthwash or mixed with baking soda for use as toothpaste. Here is how I use it as a tooth whitener. First you must dilute the 35% to 3%, (instructions are below). Then all you have to do is hold the H2O2 in your mouth for about 10 minutes per day. I keep a bottle of the 3% solution in the shower and put some in my mouth while I take a shower. Please brush before using the H2O2 to remove any debris and plaque so the hydrogen peroxide can work directly on the stains on your teeth. Use caution when handling 35% hydrogen peroxide. Do not get it on your skin. At this strength it will burn your skin. Also follow the manufacturer's instruction on storage. It should be kept in a cold place like your refrigerator. The 35% can be purchased on the internet, in fact you can order on my website. When I started looking for it I was not able to find a local store that sold it. Maybe if you live in a REALLY large city you might be able to buy it locally. Step One Pour some of the 35% H2O2 a measuring cup. Fill to 1oz. Step Two Add this to 11 ounces of distilled water. This will yield 12 ounces of 3% hydrogen peroxide. Please label the bottle. You do not want someone to think it is water and drink it. I usually just double this by adding 2ounces of 35% H2O2 to 22 ounces of distilled water. I double it because I use it for many other things besides tooth whitening. Using it at this dilution a bottle of the 35% lasts a long time. Some manufacturers of H2O2 will sell you a 35% solution that is not food grade that contains heavy metals and stabilizers. Be careful what you buy! If you choose to use the food grade hydrogen peroxide please consider buying it on my website. You will receive the purest H2O2 that is available! No chemicals or heavy metals!